taught together with Joel Ryan. The aim of the course is to reflect on and experiment with the translation of ‘abstract’ structures or data (say numbers, or strings of characters) to images, sounds or whatever else you can think of. 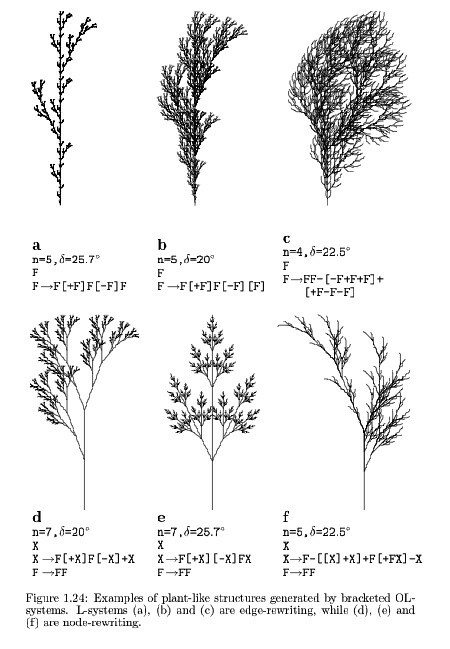 By way of a case study we will work with L-systems, very simple and elegant grammars originally developed by biologist Aristid Lindenmayer to describe the growth of plants and trees. The first week of the course will be an introduction to L-systems and the way they are normally used: to model the shapes of plants and trees. We will use jitter to experiment with them, so there will also be a (short !) introduction to jitter. The second week the students are asked to investigate and realize an application of these L-systems to a system which produces images or something else which develops over time, and we will be working towards a modest presentation of the results on friday afternoon.